The Cypress Twig Gall Midge Fly (Taxodiomyia cupressiananassa, family Cecidomyiidae) is now producing second generation galls in southwest Ohio. The spongy, snow-white galls are most commonly found on baldcypress (Taxodium distichum) where heavy galling may occur year-after-year on highly susceptible trees. Galls may also arise to a lesser degree on pond cypress (T. ascendens). The 1/8 - 1/2" long galls appear white due to a covering of fine, powdery material. Rubbing the powder off reveals the gall's true light green color. Old galls become shriveled and turn purplish-brown. The common name "twig gall" is technically inaccurate since these are not stem galls; they arise from the base of leaflets. Indeed, needles extend through the galls to protrude beyond the gall surface and a portion of new leaf growth usually extends beyond the tips of the galls. Slicing open the galls will reveal multiple larval chambers with each chamber containing a single tiny, orangish-yellow midge fly larva (maggot). The size of the gall depends on the number of maggots that are housed within the gall. However, this relationship can be unreliable at this time of the year because small, second generation galls are now forming. The flies have two gall-making generations per season in Ohio. The midge flies spend the winter as larvae inside galls on the ground that have detached from the trees in the fall. The immature flies pupate in the spring with adults emerging to fly to the newly expanding leaf buds where they lay eggs to initiate gall formation. Larvae in the resulting first generation galls appear to pupate within galls that remain attached to the tree. The second generation galls that are now forming are very small and located at the tips of leaflets. The galls will gradually enlarge as the larvae develop towards maturity. It is these galls that are shed in the fall, along with the baldcypress foliage, to drop to the ground and provide winter quarters for the midge larvae. 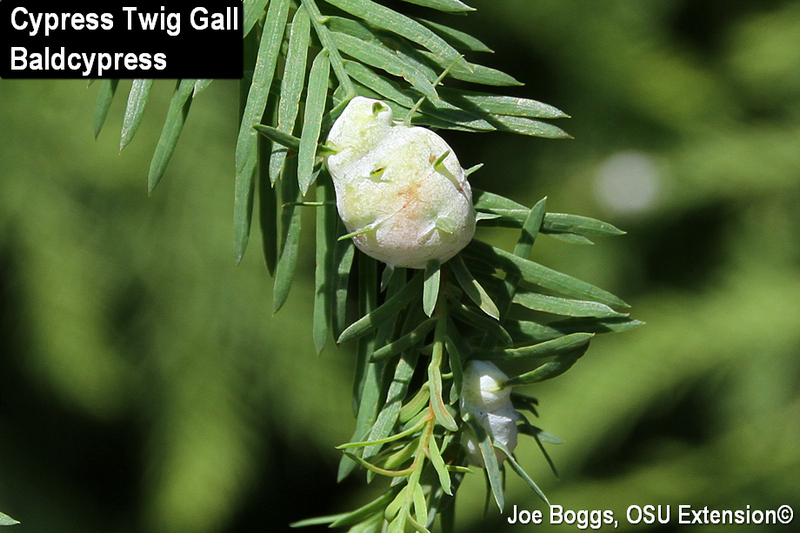 As with the vast majority of plant galls, cypress twig galls cause no appreciable harm to the overall health of their tree hosts. However, their snow-white appearance against the dark green foliage of baldcypress makes them very noticeable. Also, the foliage extending from the tips of the galls may turn brown further reducing a tree's aesthetic appeal. Unfortunately, there are no effective chemical control recommendations to suppress this midge fly gall-maker. Adding to the challenge, it appears the genetics of some trees makes them very susceptible to gall formation. It's common for one baldcypress tree to be heavily galled year-after-year while nearby trees remain free of galls. Pruning and destroying newly forming galls right now may be helpful in reducing populations on small trees. However, heavy galling indicates the tree is highly susceptible to the handiwork of the cypress twig gall midge fly. Ultimately, knees won't be the only thing that stands out on the tree.